Description: Works in a team environment producing large sheets of plastic including saw operation, grinding, and quality inspection with the opportunity to advance from within. We offer a clean working environment as well as top wages in the area, excellent benefits including medical, dental, vision & life insurance, quarterly Gainsharing Bonus Plan, 401(k) Plan with a company match, paid vacation, etc. Requirements: Must be able to stand on feet for entire length of shift with the exception of breaks/lunch (11.5 hours), lift 50+ pounds, be able to work in a high temperature work environment, have ability to do math computations on a calculator, be able to accurately read measuring devices, able to pass a background check and drug test. Solid work history required and previous manufacturing experience a plus. 1100 N. Toledo Blade Blvd. 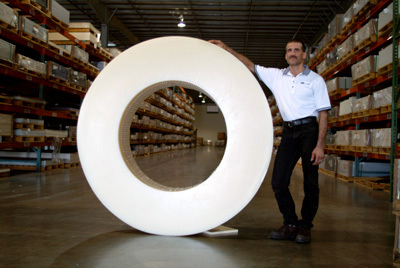 King Plastic Corporation is one of the oldest, most respected manufacturing companies in Southwest Florida. With more than 100 employees, we are also among the largest. Our size and stability allows us to offer excellent pay and benefits, opportunities for advancement and a great working environment. If you're looking for a career with a company you can be proud of, look no further than King Plastic Corporation. Since 1968, our family-owned company has been an industry-leading manufacturer of polymer sheets, slabs and massive shapes used in the marine, food service, sign, medical and other industries. Each of our products is described in detail on this site. King Plastic Corporation is a drug-free and equal opportunity workplace.